Robert J. Sawyer » Blog Archive » Did the U.S. have to drop atomic bombs on Japan? by Rob - October 3rd, 2017. A friend wrote to me today urging me to read Killing the Rising Sun as, by he said, Bill O’Reilly, since it made the case that the U.S. had to drop atomic bombs on Japan. You underestimate me, my friend; I’ve already read to Killing the Rising Sun. The key issue out of the Potsdam conference, which O’Reilly (and Martin Dugard, who actually wrote the book for him) gloss over, is that Japan was willing to surrender well before the bombs were dropped on Hiroshima and Nagasaki; they simply weren’t willing to surrender unconditionally. They considered their emperor (Hirohito) to be divine, and they needed him to at least putatively remain as post-war head of the Japanese state (under whatever international oversight might be imposed). I believe Japan is susceptible to reason in such a crisis to a much greater extent than is indicated by our current press and other current comment. Japan is not a nation composed wholly of mad fanatics of an entirely different mentality from ours. On the contrary, she has within the past century shown herself to possess extremely intelligent people, capable in an unprecedentedly short time of adopting not only the complicated technique of Occidental civilization but to a substantial extent their culture and their political and social ideas. Her advance in these respects … has been one of the most astounding feats of national progress in history …. It is therefore my conclusion that a carefully timed warning be given to Japan …. I personally think that if in [giving such a warning] we should add that we do not exclude a constitutional monarchy under her present dynasty, it would substantially add to the chances of acceptance. It is His Majesty’s heart’s desire to see the swift termination of the war …. However, as long as America and England insist on unconditional surrender our country has no alternative but to see it through in an all-out effort for the sake of survival and the honor of the homeland. We had so much trouble getting those two French generals together that I thought to myself that this was as difficult as arranging the meeting of Grant and Lee — and then suddenly the Press Conference was on, and Winston and I had had no time to prepare for it, and the thought popped into my mind that they had called Grant “Old Unconditional Surrender,” and the next thing I knew I had said it. Churchill immediately concurred — “Any divergence between us, even by omission, would on such an occasion and at such a time have been damaging or even dangerous to our war effort” — and unconditional surrender became official Allied policy. « Double Aurora Award win! 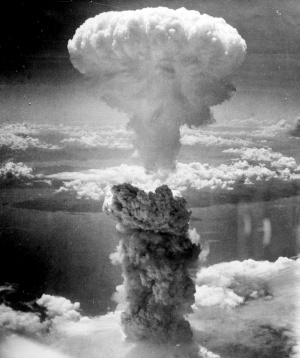 1 Response to Did the U.S. have to drop atomic bombs on Japan? Freeman Dyson, who is old enough to be considered a WWII contemporary said in an Interview ( on YouTube) similar things about the non- necessity of the Atom bomb droppings on Hiroshima and Nagasaki. It’s the man with the Dyson sphere, he has to say many interesting things (also views I do not share).